Valleywag has obtained detailed internal financial information indicating that Uber, the e-hailing app that has spawned a hundreds of half-baked pitches, is making a lot more money than its investors had anticipated. Above is a two-week-old image screengrabbed from what appears to by Uber's internal dashboard, sent to us by a tipster. The image shows raw numbers, including revenue, signups, active clients, and ride requests versus ride completions for the self-stylized bad boys of Silicon Valley between mid-October and mid-November of 2013. 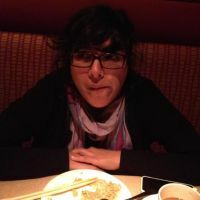 According to the anonymous tip, the screenshot was "taken while one of [Uber's] employees helpfully logged into their admin console from my computer." We reached out to Uber representatives last night to confirm that it was from their dashboard, but CEO Travis Kalanick declined to comment. The domain in the screenshot, however, appears to be a custom built tool off the Uber.com website. 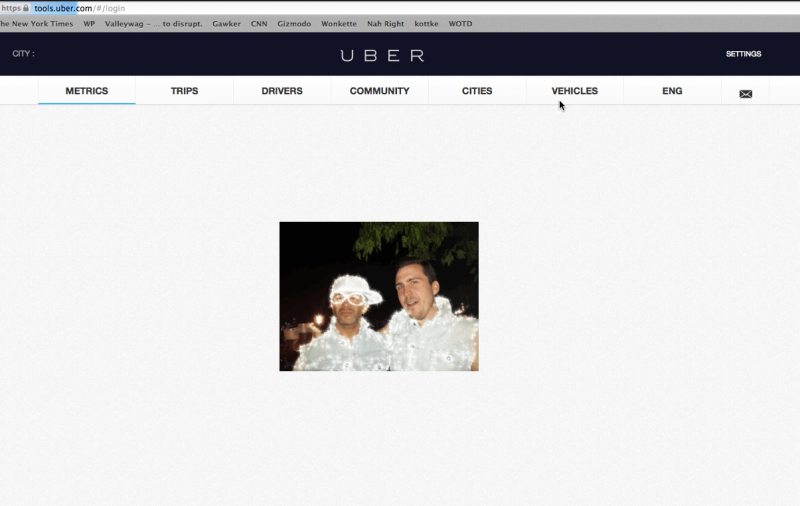 Even without a username and password, the log-in page partially loaded for us twice, showing the same drop-down categories as the screenshot, as well as what looks like a picture of Kalanick, on the left, in an all-white lightbulb costume. Google's reverse image search turns up no matching results for the festive photo. 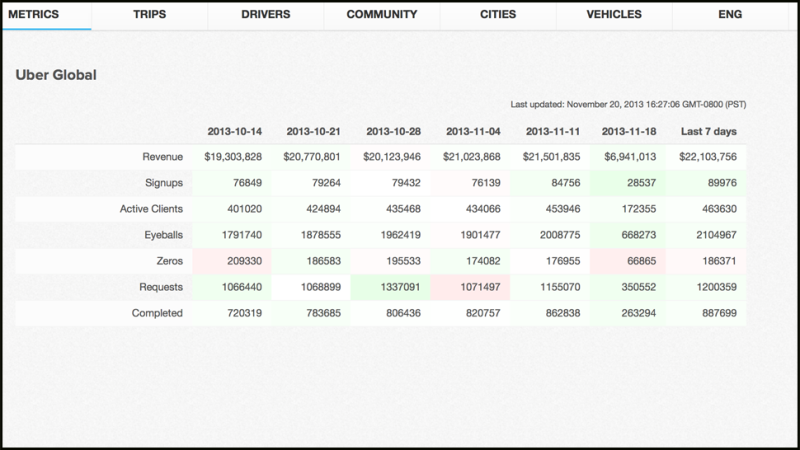 The screengrab only shows data for "Uber Global." But it's not clear whether that includes all of Uber's products—Uber Taxi, UberX, Uber Black Car, Uber SUV—in all the cities and countries where Uber is currently operating. For example, they just launched in a second Chinese city, Shenzhen, last week. When Uber raised a stupefying $258 million from Google Ventures and TPG Investments back in August, Kara Swisher reported that Uber was on track to make $125 million in revenue in 2013, "much higher than had been projected, and that number is growing quickly." Those investors plowed hundreds of millions of dollars into Uber assuming the company was worth $3.5 billion. If the $210 million figure is correct**, projections are 68 percent higher than sources told AllThingsD in August. Of course revenue numbers don't reflect profitability. Uber's rumored plan to use the new funds to "become the exact thing it hates" by building its own fleet of cars and monopolizing the car-for-hire market will be costly. The company has thus far primarily operated as a middleman, building partnerships with black car companies or cab drivers. Nothing stopped drivers from working for Uber and its competitors at the same time, which is why last month Kalanick "partnered" with General Motors and Toyota to offer drivers discounted financing or leasing on cars in exchange for exclusivity. Then there's the cost of Uber's lobbyists, the cost of driver strikes, global expansion, the lawsuit over skimming drivers' tips, frequent promotional offers for free rides and the occasional mewing, soft serve attempt at soft power. Uber Is Literally Delivering "On-Demand Kittens"
The document also breaks down Uber's data by categories like Active Clients, Eyeballs, and Zeroes. Over that five-week period in October and November, Uber averaged 79,000 new signups per week, or 316,000 signups per month and 3.8 million annualized. It's not clear whether signups refers to users who have downloaded the app or if it also includes people who merely filled out Uber's online sign up form. The average number of "eyeballs" per week was 1.9 million. The average number of rides requested per week is 1.1 million. For rides completed it's around 800,000. The average percent of rides requested that were also completed was 70.5 percent, which seems high if you've ever used Uber to hail a yellow taxi in Brooklyn. Uber's average number of "active clients" for the five full weeks depicted was 430,000 per week. It's possible that "active clients" refers to users who made a transaction through the app, and that "eyeballs," a common term for online traffic, refers to people who merely opened the app or visited the website. An industry source said active clients are probably people who have used the app within the past one to three months, adding that "zeroes" likely refers to no shows for requested rides as well as non-users. If active client correlates to active users—a very important metric for the future of a company—a source told Valleywag a handy rule of thumb: To account for returning repeat traffic, numbers for daily active users (DAU) usually represent 25 percent of monthly active users (MAU) and that weekly active users represent 50 percent of MAU. Using that back of the envelope calculation—and assuming active clients equals active users—Uber's MAUs would be in the neighborhood of 860,000. Regardless of what this random screenshot that showed up in our tips box proves, Kalanick wants his console to get a lot more complicated. Uber is so much more than car rides, he assured Bloomberg last week: "Uber is a cross between lifestyle and logistics. Lifestyle is gimme what I want and give it to me right now and logistics is physically delivering it to the person that wants it . . . once you're delivering cars in five minutes, there's a lot of things you can deliver in 5 minutes." *That $210 million figure is based on the combined revenue of first five columns, which shows an average of $20.5 million per week. Annualized, that's $1.068 billion for 2013. However, considering that Uber's last reported revenue figure from August was an estimated $125 million for the year, it seems most likely that the billion figure shows the total payment for the full cost of the rides, rather than the money coming to Uber. Last week, Kalanick told Bloomberg to "generally think of [Uber's cut] as 20 percent," which gets us to $213 million in revenue for 2013. However, Uber could end up making a considerable amount less than that since the startup has added more cities and countries and likely grown its top line over the course of the year. In the same Bloomberg interview, Kalanick said Uber Black, its much pricier option, has grown "13 or 15 percent month over month" whereas Uber is "seeing more robust growth or maybe just more insane growth on the lower end than we are on the high end." **Update: As we noted directly above, Uber could end up making a considerable amount less than $213 million. But AllThingsD offers a crucial data point, noting that in the second half of 2013, Uber went from 35 cities to 60 cities worldwide. Thus, annualizing this five week period, particularly when November is likely a strong month for the service, would skew revenue much higher. Kalanick argues on Twitter that November is Uber's "slowest month of the year." If you want to take a stab at analyzing the screengrab or have a better understanding of what these numbers reveal, please comment below or email nitasha@gawker.com.